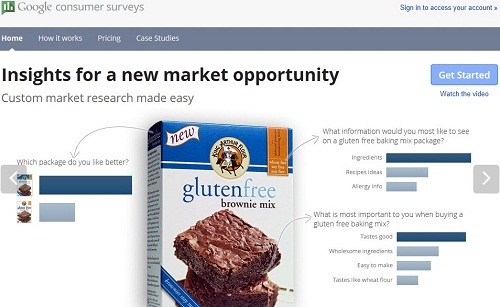 I always thought that online market research is yet to reach its full potential. In times where the internet connecting the whole freaking world together, you would have expect to conduct a research for your business easily, fast and with reasonable price. Don’t get me wrong here, there are few good relatively cheap research products out there like Polldaddy or SurveyMonkey. However, they still don’t offer the deep penetration, reach and targeting customizations some business owners may need, while other companies research products that do provide those things aren’t affordable to many. What may fill this vacuum is a new market research product Google has just introduced where it suppose to offer fast, accurate and affordable insights for business owners, called Google Consumer Surveys. The model of this product works in the same way which proved to be successful for the company with AdSense and AdWords- It approaches both businesses that wants to conduct a market research and also to publishers that can earn some money by featuring these surveys on their websites. Enter the Get Started page and type the basic details of your survey (name, description, tags) or choose them from eight different patterns. Choose the designated audience to answer your questions out of these three options- General U.S. representing sample, based on gender / age / geography or by using a screening question. Write your survey’s questions (at least one) through the seven formats available. Confirm the purchase of your survey. For general U.S. representing sample the price is $0.1 for each participant and for advanced targeting (gender/age/geography or screening question) the price is $0.5 for each participant. The minimum amount of responses is 1000 and the maximum amount is 10,000 responses. Meaning that if choosing 1,500 responses with advanced targeting it will cost $750. Not so expensive when considering the reach and the targeting customization. As I stated, the program is offering site owners the possibility to earn some money by featuring surveys on their websites. The implementation suppose to be very easy “AdSense-style”, meaning installing a simple code on the page. The publisher can choose how visitors will answer the questions- Voluntarily or by using alternate actions. Google doesn’t offer at this point exact details about the revenue split, but states it depends on the number of responses, content quality, placement and bounce rate. If you wish to become a Consumer Surveys fill out this form.